Researchers reported that a peripheral nerve injury in a transgenic rat model of amyotrophic lateral sclerosis generated an inflammatory cascade in the spinal cord that precipitated earlier onset of the disease. New evidence from transgenic rats with the human gene that causes amyotrophic lateral sclerosis (ALS)—superoxide dismutase-1 (SOD1)—suggests that a peripheral nerve injury can speed up the ALS disease process, a finding that may have implications for some ALS patients. Only about 2 percent of ALS patients have familial disease linked to the SOD1 mutation. The scientists from the University of Illinois at Chicago found, however, that in the ALS animal model, a crush injury set in motion an inflammatory cascade—with enhanced glial activation—an immune response observed in studies of sporadic ALS. “For those who diagnose and treat ALS patients, it seems we all have anecdotal evidence of the patient who just happened to have an injury in the same limb where the ALS disease first started. Many of these folks were quite fit and athletic,” said the senior author of the study, Jeffrey A. Loeb, MD, PhD, the John S. Garvin chair, professor, and head of the department of neurology and rehabilitation at the University of Illinois at Chicago. The study was published in the April issue of Neurobiology of Disease. The puzzle in ALS is that the symptoms are so variable. The disease starts in the upper body for some and the lower limbs for others. No one knows why. “There has to be an environmental contribution,” Dr. Loeb said. To test that thesis, Dr. Loeb and his colleagues used a rat model with the human SOD1 mutation to assess whether peripheral nerve damage may play a role in starting and perhaps accelerating the ALS disease process. The researchers collaborated with the hospital's orthopedic surgeons for help in developing a sciatic nerve crush injury. They exposed and pinched the sciatic nerve that feeds the leg and all three branches were crushed around the mid-thigh in the rats. The experimenters did not know the genotype of the rats they were assessing. They compared functional outcomes following crush injuries in healthy wild-type rats, injured SOD1 rats, and SOD1 rats with no damage to the sciatic nerve. The rats were ten weeks old when they suffered the injury. Functional recovery measurements were performed on each animal. In wild-type rats with the injury, the animals dragged their hind legs for a few weeks and then began to walk normally; they completely recovered by five weeks. The injured SOD1 rats dragged their foot on the ground for three weeks and showed some improvement by five weeks but never fully recovered to their baseline levels that were measured a week before the crush injury. By this time, the other leg was showing signs of weakness. The SOD1 rats that were injured showed signs of weakness in tests of hind limb strength at about one-week post injury (at 11 weeks of age) compared with 15 weeks (25 weeks of age) in the animals that had not been exposed to a nerve injury. The disease started a month earlier than it would have without a nerve injury, said Dr. Loeb. The four injured SOD1 rats reached the end stage of the disease by a mean of 36.25 weeks compared with their three SOD1 littermates who lived on average to 42.33 weeks. The numbers were too small to reach statistical significance. “Microglia are known to prune synapses off neurons,” said Dr. Loeb. The motor neurons are useless without their connections. The injured SOD1 animals didn't live as long as SOD1 rats without a crush injury, he noted. Dr. Loeb added that the research team observed an overexpression of mutant SOD1 protein in the ventral spinal cord in the injured SOD1 animals compared with the non-injured SOD-1 animals, which could have been the cause of this increased inflammatory response. “It is a combination of a genetic vulnerability and an environmental insult. I think we need to address both risks in our patients, particularly if they have a known genetic risk,” he added. The investigators are continuing their studies with this model system to see whether blocking the spread of this overactive glial response in the SOD1 rats can change the course of their disease—using a peripheral nerve injury as a new model to start the clock ticking and screen for new treatments. The group is also looking more closely at patients with a focal disease onset, who, even years earlier, suffered from an injury in the same region of the body where the ALS started. Drs. Loeb, Ravits, and Appel reported no competing interests. •. Schram S, Chuang D, Schmidt G, et al Mutant SOD1 prevents normal functional recovery through enhanced glial activation and loss of motor neuron innervation after peripheral nerve injury https://www.sciencedirect.com/science/article/pii/S0969996118304753. Neurobiol Dis 2019; 124:469–478. •. Liu J, Allender E, Wang J, Simpson EH, et al Slowing disease progression in the SOD1 mouse model of ALS by blocking neuregulin-induced microglial activation https://www.sciencedirect.com/science/article/pii/S096999611730298X. Neurobiol Dis 2018; 111:118–126. 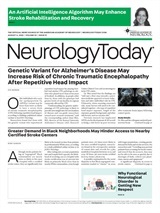 Neurology Today19(7):16-18, April 4, 2019.